Recruit & Grow Rich is an amazing book. One of my friends actually recommended I read the book. It’s written by a guy named David Ward. David is a very successful rep in the industry. He’s a top recruiter and top earner. This book is no-nonsense, to the point and absolutely jam packed with great information. My copy of the book has HUNDREDS of underlined passages. Overall, I give it a 9 of 10 and HIGHLY recommend it to any serious network marketer. What I want to do below is share some of my favorite quotes from the book. Each quote is in bold and italics. After each quote I will share my own two cents on the topic. They are listed in chronological order. Enjoy. # 1 If you aren’t having the success you want in your business, there are only two reasons. Either you’re not doing something right or you’re not doing enough of it. This is such sage wisdom. Evaluate how you are spending your time in your business and be honest with yourself. You’re either not being effective or you are not putting in enough work. It really is that simple. # 2 A few things make a big difference. Most things don’t. Keep the main thing the main thing. Don’t confuse busy work with being productive. Spend at least 90% of your business hours on money producing activities. 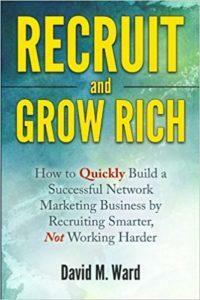 # 3 In network marketing, you gain leverage through recruiting. Your ultimate goal in this business is to build a network of distributors who each consume the products, retail a few products, and sponsor other distributors. It’s not just about selling the product. The beauty of this business is a lot of people doing a little bit each. That’s where the leverage comes from. # 4 You can get a lot of things wrong in your business, but if you are a good recruiter you will be successful. Even if you aren’t good at training people, you can succeed. Even if you don’t have a great system in place you can succeed. Ultimately, this business is a numbers game. Show me someone who can personally recruit a lot of people and I will show you someone who can succeed. That being said, it’s smart to have a good system in place and help your team members build. # 5 If you’re in business just for the money, it’s difficult to stay motivated long enough to be successful. Most businesses take a couple years just to get profitable. If you don’t love what you are doing, you won’t stick with it through the difficult times. This is why it is important to have a product or service that you really love. # 6 Ray Kroc sold the dream, not his hamburgers. McDonald’s became successful because of the franchise method: recruiting others. Their goal wasn’t just to sell hamburgers. Instead, it was to build a network of franchisees who each sold hamburgers. # 7 Everyone starts their network marketing business in the “S” Quadrant. When you first get involved in network marketing you don’t have much leverage. In the beginning, it is typically just you doing all the work. However, as you build your team, you start to get some leverage. Once your team has a few thousand distributors in it you have a lot of leverage. That is your ultimate goal. # 8 You want your business to sell a lot of products. The only way we get paid is on sales. But you don’t have to the be the one who sells all those products. If you just focus on selling, you have yourself a job, you have no leverage and no residual income. Your goal is to build a team, where each person sells a little bit and recruits others. This is the goal in network marketing. # 9 If you want to increase your income, recruit. In network marketing, recruiting truly is everything. Recruit, recruit, recruit. And retail a little bit. To clarify, every distributor should have two to ten personal customers. But, it makes very little sense to go out and get more customers than that. # 10 You can earn a good living by selling; you can earn more by building a team. If you just sell, you will never build a walk away income. Instead, you need to build a team of people who recruit and sell. This leverages your time and allows you to create residual income. # 11 People won’t take you seriously if you act weird or vomit a bunch of information on them. Say less to more people. Ask questions. Be a good listener. Be yourself when you talk to people. Find out what the other person wants first, and then show them how what you have to offer them will help them get what they want. In addition, use third party tools to do the presenting for you. # 12 The biggest key to duplication is using tools and events to deliver the information to your prospects. Teach everyone on your team to use third party tools to explain the business to their prospects. This keeps the business simple. # 13 Your job is not to explain the business. It is to contact people and invite them to see or hear some information which is delivered via a tool or event. Remove yourself from the equation. Use third party tools to show the plan. # 14 Network marketing is a simple business. Many distributors struggle, however, because they don’t keep things simple. Keep it so simple even an eight-year old could do it. The beauty of this business is the simplicity. It takes a genius to keep things simple. Do not reinvent the wheel. # 15 Duplication means using tools, but not necessarily the same tools. There is more than one way to build a successful business, but encourage everyone to use tools whenever possible. # 16 Network marketing is a warm market business. Yes, you can build your business online. I do. But, most people should start with their warm market. Most people don’t know how to build online and the learning curve is very steep. Anyone can sponsor a close friend. # 17 It’s true, not everyone will be supportive or willing to help. But you are more likely to get help from people you know than from strangers. If you can’t sign up people you know you will more than likely struggle to sign up strangers. Starting with the people you know will teach you the ropes and help you sign up your first few reps.
# 18 Never assume someone won’t be interested. Never pre-judge people. Give everyone the chance to decide for themselves. Typically, the people you think will be interested won’t join, and the people you think won’t be interested will want to join. # 19 Network marketing isn’t only about who you know; it’s about who they know. It’s doesn’t really matter who you sign up. It’s who they know. And who they know. Your best people will typically show up many levels deep in your organization. # 20 Your network marketing business doesn’t start until you make a list. Come up with a big name list, ideally 500 to 1,000 names. Write down all your Facebook contacts, cell phone contacts, email contacts and holiday card list. If you did this you would have at least 1,000 names. # 21 Don’t expect facts and figures to get anyone excited. The magic is in your story. Facts tell, but stories sell. Appeal to people’s emotions rather than using logic. Use stories to share your message whenever possible. # 22 Recruiting is sometimes defined as the process of transferring emotion from you to your prospects. Get excited and stay excited. Excitement is transferred from the salesperson to the prospect, not the other way around. # 23 Recruiting is about attracting people, not chasing them. Become the type of person you are looking to sponsor. Remember that people join people, not businesses. The only way to become more attractive to your prospects is to work on your skills. # 24 I lead with the opportunity and mention the product. I’m looking for people who want to build a business. Yes, you need customers. But recruiting distributors is quite perhaps the fastest way to find new customers. # 25 If you want to recruit a lot of people, you need to talk to a lot of people. The best way to do that is on the phone. You have to work the numbers and sort through a lot of people to find your key people. You need to work smart so you can be efficient and effective. The phone is the fastest way to sort through a large number of prospects. # 26 When you use the phone, you can control the entire exposure process. You can’t do that with email. Don’t make your initial contact by email. There is a good chance it won’t make it to their inbox or get read. Reach out to your contacts by phone first, to get their attention, and then send them an email with the information. # 27 If you want to recruit a lot of people, and do it quickly, you can’t afford to spend an hour with every prospect. You have to work smart and be efficient. Use tools and use the phone whenever possible. Your job is to sift and sort through prospects, not convince and sell prospects. Say less to more people. Get a yes or no as quickly as possible. You are looking for people who are looking. # 28 I’ve found that most people who have signed up in a network marketing business before will often do it again. Even if they had a bad experience. They still want extra income. Current and former network marketers make great prospects. In reality, they are your target market. # 29 If recruiting is everything in network marketing, exposure is everything in recruiting. The more exposures you make the more people you will recruit into the business. PERIOD. Make it a point to expose minimum two to ten people to your products and/or business each and every single day. # 30 The best thing to do is to emotionally detach from the outcome. Don’t focus on the results, focus on the activity. The only way to be disappointed is if you have an expectation of your prospect. If anything, hope everyone will say yes, but expect everyone to say no. Focus on the the one thing you can control: the number of people you talk to. # 31 Professionals sort. Amateurs convince. It’s not your job to pressure or convince anyone to join the business. You are looking for people who are looking. # 32 Tell me yes or tell me now, but tell me quick, I’ve got to go. This is a great mindset to have in your business. The last thing you want to hear is “maybe” or “I have to think about it”. Your job is to get a yes or no as quickly as possible, so you can move on to the next person. # 33 You don’t want to leave your business in the hands of someone else. You want to take responsibility for the follow up. If you wait for your prospect to get back in touch with you there is a good chance it will never happen. You have to be proactive. Always set a time and date for your next follow up with each prospect. # 34 Don’t expose and run. Take another minute and confirm everything. Always confirm the follow-up appointment (date and time) with your prospect. Otherwise, you will end up playing cat and mouse. # 35 Be consistent. Do exposures every day. Consistently make two to ten exposures every single day and NEVER miss a day. EVER. You want to create the habit of sharing your products and business opportunity with new people every day. # 36 Recruiting is like dating. You don’t ask a girl to marry you on the first date. Most people will need eight to twenty exposures and/or follow ups before they sign up or buy. Don’t expect people to sign up or buy on the spot, the first time they learn about what you do. The fortune is in the follow up. # 37 The most important part of any presentation, live or recorded, are the testimonials. Use testimonials in everything you do. Get testimonials from your happy customers and distributors and share them with your prospects. Your prospect will believe a testimonial more than they will believe you. # 38 Follow up means taking the prospect from exposure to exposure until they say yes or no. Your real objective is to collect a decision. A Yes or a NO is much better than MAYBE or I HAVE TO THINK ABOUT IT. Every time you do a follow up with your prospect, ask for the sale. If they say no, or aren’t ready to make a decision, schedule them for their next exposure. # 39 Someone can go from not interested to very interested in the blink of an eye. The timing for people can change. It will change. That’s why you need to stay in touch with people. A No today does not mean No forever. The key is to never pressure people, and to stay in touch often. # 40 If they ask lots of questions, it usually means they are interested. Questions are good. So are objections. It just means they need more information to make a decision. # 41 Always schedule the next exposure (date and time) before you end the conversation. Never end a meeting or appointment without setting up a time and date for the next one. # 42 If you don’t guide them towards making a decision, they might never do so. You have to lead your prospect to a decision and ask them to buy. Otherwise, they will do nothing, even if they are interested in what you are offering them. # 43 Whatever is best for them is best for you. Take your eyes off yourself and focus on what’s best for your prospect. Show them what’s in it for them and they will move the mountains and earth to get it. # 44 It’s always better to have someone else close your prospects. Use your upline, sponsor, or even someone successful in your downline to help you close your prospects. # 45 When you work with a new distributor, your primary objective is to recruit someone they know. Every new distributors has at least 1-2 people who will join their team. Your job is to help them sign up someone in their first 24 hours, and then start working with that person. # 46 Placing distributors down line instead of front line may also turn out to be costly for you, if it causes distributors who are not working the business to get promoted and earn overrides that would otherwise come to you. I’ve made this mistake several times. Placing people you sponsor under other people is a complete waste of time, money and resources, unless it is a binary compensation plan. # 47 The business still works, even if only a small percentage work the business consistently. Just because most people quit doesn’t mean the business isn’t good. 1-2 distributors who stick around and build it big is all you really need to build a big team. # 48 You only need a few serious distributors to build a successful business, but you almost always have to recruit more than a few to find them. You might recruit twenty or thirty to find one or two leaders. Most top earners make most of their money from just one to five people, even if they’ve sponsored hundreds. That’s just the way the business works. # 49 Forget about the ones who weren’t doing anything and focus on the ones who were. Even if it’s just one or two. Spend your time with the workers. One or two good workers is all you need to build a big team. # 50 You can’t get anyone to do anything if they don’t want to. It’s not your job to motivate people. Each distributor is their own boss and is responsible to motivate themselves. This is a volunteer Army. You are no one’s boss. # 51 Talk is cheap. Distributors are either doing these things or they aren’t. Watch the feet, not the lips. Most people who talk a big game will do nothing. Work with he people who are working. Ignore what people tell you and watch what they do. # 52 You can’t waste time trying to drag people across the finish line. If they’re not making the effort, why should you? Don’t do more to help people than they are willing to do to help themselves. Work with the willing. You can’t make anyone else successful, if they don’t want it for themselves. # 53 You attract what you focus on. The law of attraction is always working. It’s either working for you or against you. # 54 If you have distributors who aren’t doing much, don’t blame yourself. It’s not your job to make people successful. Ultimately, you have no control over what others do to build their business. # 55 If your people aren’t doing anything, don’t try to fix them or motivate them, get some new people. You won’t get to the next rank with the same team. If the people on your team aren’t actively building their business, go out and recruit some new people. New blood is the lifeblood of your business. # 56 Most distributors will never be leaders in your business. Most people are not leaders, nor will they ever be, even if you want them to be. Your job is to find leaders. # 57 Find the spark in your organization and pour gasoline on it. Work with the willing. Always work with the newest, most excited people at the deepest level in your organization. Build the business from the bottom up. In addition, use contests to great massive growth and excitement. # 58 Network marketing is an event driven business. Build your business from even to event. Promote events like your life and business depend upon it. # 59 Live events re-sell the business to your distributors. Promote events and get all of your team members to go to every event. Attend all events yourself. 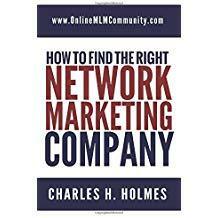 # 60 The internet will never replace the human element that is essential for long term success in network marketing. This will always be a people business. High touch beats high tech. This business is a numbers game initially, but after people join the business it becomes a people business. # 61 My advice is simply to recruit as many as you can as fast as you can. Take massive action and recruit as many people as you can, right out the gate. Keep recruiting until you have enough serious people to work with (at least 5). The quicker you can recruit people, the faster your business will grow. # 62 How much you earn really isn’t anyone else’s business. There is no need to share your income level with anyone. It’s not their business to know. The only people who need to know how much money you make in the business are the IRS and your spouse. David Ward is an attorney, network marketer and author of several books. He is a six figure earner with his network marketing company. He lives in California with his wife. Visit his website here. Recruit & Grow Rich was released on March 8, 2016. It comes in paperback and Kindle formats. It has 33 customer reviews on Amazon with an average 4.6-star rating (as of August 2016). The book features 214 pages. The ISBN is 978-1530355563. Order a copy on Amazon. I hope you have enjoyed these valuable lessons from Recruit & Grow Rich. If you haven’t read the book yourself yet, order a few copies and share it with your team. You will be glad that you did. What is your favorite quote mentioned above and why? Leave a comment below to let me know what you think. I look forward to hearing from you.